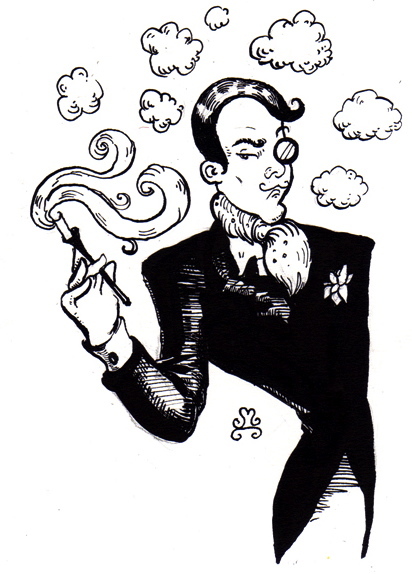 Once a gem, now hit into the rough… Emeraude by Coty The Perfumed Dandy’s Sunday (Evening) Scent | The Perfumed Dandy. Is it heresy to enjoy a little spice on a balmy summer’s eve? The Dandy certainly doesn’t think so, therefore it should come as no surprise that I have been reaching for my trusty new “old” bottle of Emeraude by Coty of late. Sometimes erroneously called “Shalimar’s little sister”, as Chypre is to Mitsouko it could be argued, Emeraude is to it’s more famous Oriental sibling. Francois Coty venturing in 1921 where Guerlain would follow some four years later. Unfortunately, I have never had the opportunity to try a version from before the 1960s and my present edition shown above is much more contemporary. Nevertheless, even from vintages as recent as this, Emeraude is a perfume that lives up to its precious name. It has a splendid citrus and pepper opening, turning resinously spicy before billowing into the great vanilla powder puff clouds that it is rightly famous for. Emeraude is an easy, enveloping and lovable scent, youthful even as it approaches its one hundredth birthday. I’ve always been surprised no one has suggested I review this fragrance, perhaps it’s because the present incarnation is just so, well, plain. Talking of suggestions, don’t forget there’s still time to vote in The Hit Parade this weekend, and help decide what I should wear come Monday. Always a pleasure to read about a classic! Many thanks. I am so glad that someone is in agreement on the merits of Emeraude, I love my little new bottle and it has been ‘stepping out’ quite a lot this weekend. Do you know, is it true that this is one that gets much older with age? I can smell it in my smell brain ( I too have only smelled the recent trashier editions ) but can’t quite seem to work up any enthusiasms for my memories. Have you tried Chantilly? Somehow I remember that one as being in a similar vein but silkier and more alluring. Glad you reviewed this little gem, though. I too get older with age. I adore Chantilly. It is my guilty secret, not really guilty and not secret, but it is one of my favorite private time indulgences, both the vintage fragrance spray and the dusting powder. It’s heavenly. I must confess to liking the name for it’s own sake, being so French, playful and yet somehow alluring hinting of lace and garters! Just perfect for a perfume. I’m assuming that old is all that will do? I have only smelled one bottle but I thought it had real depths and layers to it….very pretty indeed; mysterious, feminine. And I LOVE the idea of the dusting powder. That is what perfume is all about. My not old enough ‘cologne spray’ lacks the leathery depths of even the current EdP of Shalimar, but it does have oodles of black pepper… seemingly unlisted anywhere! It also melts into a very pleasant vanilla make up powder dry down that it dry and creamy at once. Really quite but not excessively lovely. No… or should that be not yet? Just reading those words make you know you want to. Vintage Emeraude pdt is to gorgeous. I certainly like it better than current Shalimar. I fear that old Coty perfumes aren’t easy to come by in Europe, all I’ve managed to find so far is this 25-30 year old cologne spray… the search will certainly go on though! My grandmother wore Emeraude which she bought at the Rexall Drug back in the 1950s. As kids we didn’t much like it as we thought it was too loud, but matched her bright red lips, rouge & red nails. 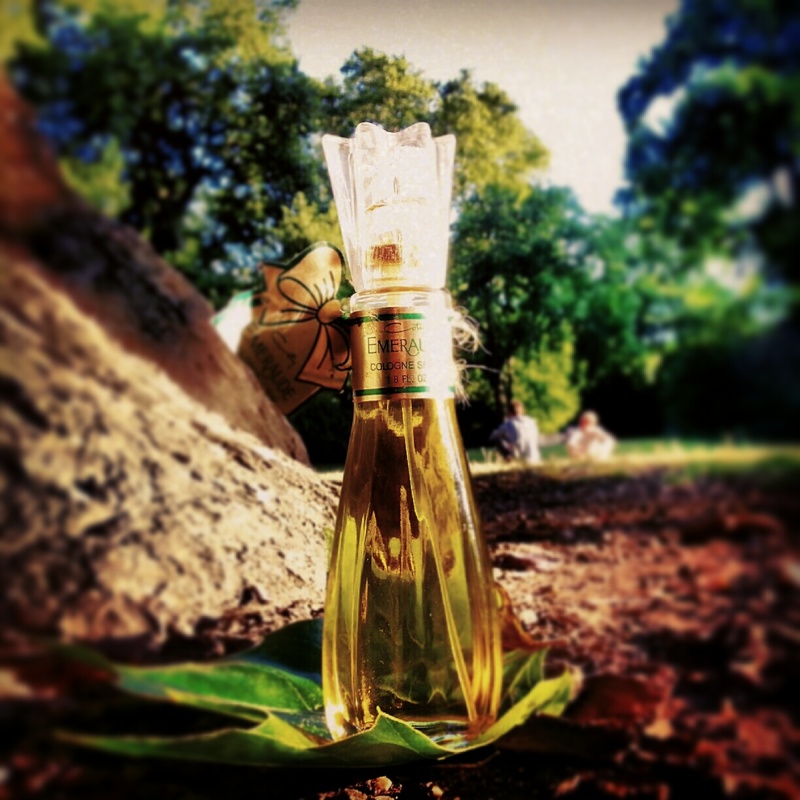 I’ve been fortunate enough to find some bottles of vintage Emeraude, including a pure parfum! It is beautiful, and definitely the mother of Shalimar. One reviewer has picked out a green note in it (from whence the name, I guess), but I don’t notice it myself. I also have some vintage L’Aimant PDT (which barely lasts an hour on my skin), and some vintage L’Origan, the forerunner to L’Heure Bleue. It’s sad how the classics of the once-great House of Coty have been cheapened to the point that they are shadows of their former selves. I’m most angry at them for ruining Muguet des Bois, once upon a time THE best lily of the valley ever. (Yes, Diorissimo is great, but ordinary people could afford MdB). Remember this one as a child in the 70s. My mom had the bottle with crown-like cap and I would dab it on while playing with my metal dollhouse to be more grown-up. Wish I had that little bottle today….I do have the dollhouse though. And what self respecting grown up would be without a doll’s house or toy castle. As for Emeraude, it is rather adult I think. I have often been intrigued by this one and I long to try it. i used to eschew anything powdery until I understood chypres and the penny dropped. Something tells me I would love Emeraude. As for Chantilly, I remember the magazine adverts in the 80s “I feel very Chantilly today”. The oldies can’t be worse than some of the newbies today. My ebay account is calling me. Indeed. Light and shade. Satin and serge. Powder and chypre. I must say, I feel the calling of Chantilly too myself. But which version to choose? Vintage Chantilly is what you want, Mr. Dandy. Dating them precisely is difficult, as the perfume has been bought and sold so many times, and I can’t seem to get precise info; but the spray version that has a label on the bottom with “Parquet Parfums, Made in France” is my favorite. The ones that are made or blended in NYC labeled “Houbigant” are pretty good, but avoid Dana, especially the most recent version blended in China. Hope that helps. Now thank you for that… it narrows my search somewhat, but probably makes it all the more difficult! Since I’ve known exactly what I’m n=looking for in a bottle of Norell it has proved entirely elusive. Let’s hope Chantilly is more forthcoming and, if not, then part of the fun is the thrill of the chase! They only pop up when you least expect them. Then you have to pounce! I’ll keep my eyes open for you on this side. But I haven’t been trawling lately. I’ll probably start back up again, though. It’s too irresistible.